The William Aldridge FoundationHere you will find forums concerning the The William Aldridge Foundation. Here you will find discussions concerning The William Aldridge Foundation web site. Here you will find out more about the Latest News and Press Releases from The William Aldridge Foundation. Here you will find discussions concerning The William Aldridge Foundation, and its aims to help injured serviceman and women, and their bereaved families. Here you will find forum posts regarding our the Charities supported by The William Aldridge Foundation. Here you will find discussions concerning events organised and supported by The William Aldridge Foundation. Or please feel free to suggest your own fund or awareness raising event! Here you will find forum posts regarding The William Aldridge Foundation Online Shop, and the products it sells. Please feel free to ask any questions, or provide suggestion for future stock items. Re: T-Shirts ... coming soon! 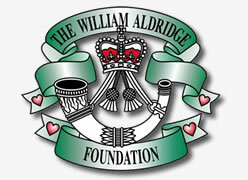 Here you will find forum posts regarding Forces Friends of The William Aldridge Foundation.